Part One - Interlocutory Injunctions will be held on January 25, 2018. This program will provide 1.5 Hours toward the Law Society of Ontario Continuing Professional Development requirements. Part Two - Rule 20 vs. Rule 21 will be held on February 8, 2018. This program will provide 1.5 Hours toward the Law Society of Ontario Continuing Professional Development requirements. As a friendly reminder, the Peel Law Association Library, Lawyers' Lounge and related services are open to all lawyers who are in good standing with the LSO, articling students, and LLP candidates. 70th Anniversary - 70s style! Bring a GUEST ($50 per person/both PLA and non-PLA Members) - Join us for cocktails, dinner, and dancing. There will also be prizes for the BEST 70s inspired attire! Be sure to arrive groovy as ever on Friday, December 8, 2017. Please contact the PLA Library for registration details: (T) 905-451-2924 or (E) info@plalawyers.ca. Cancellation Policy: No refunds will be issued unless 48 hours written notice is provided prior to the event. Seating is limited and no tickets will be available at the door. Continue to watch this space for promotions highlighting one of the books recently added to the PLA Library collection, as well as old favourites we think may be of interest to our PLA Library users. 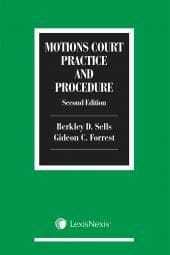 This week, the spotlight is on the book, Motions Court Practice and Procedure - 2nd ed. Berkley D. Sells and Gideon C. Forrest, which was recently added to the PLA Library Collection. Successfully navigating the ins and outs of motions court is an essential element of every litigation lawyer's practice. On July 1, 2015, the Superior Court of Justice's new Consolidated Practice Direction for Civil Actions, Applications, Motions and Procedural Matters in the Toronto Region came into effect. The second edition of Motions Court Practice and Procedure focuses on some of the key changes in motions scheduling and offers current, practical guidance on bringing and responding to motions in Ontario. This item is available for signout from the PLA Library to PLA Members only. You may borrow this item for one week (seven days). Non PLA members are welcome to use this item in the PLA Library. For a full listing of all of the new items added to the PLA Library Collection, please watch for your next issue of Peel Briefs (for PLA Members Only). Not a PLA member, but looking to become one? Please follow the links for the Membership form, fees, and a full list of PLA Membership Benefits. You may also contact the PLA Library Staff by email, and they will be happy to assist you. It only takes a few moments to join, and the PLA Library Staff can process memberships on the spot. Once payment is received, you can take advantage of all your PLA Membership Benefits, including circulation privileges. As a friendly reminder, the Peel Law Association Library, Lawyers' Lounge and related services are open to all lawyers who are in good standing with the LSUC, articling students, and students-at-law. As part of our ongoing goal to ensure our members are kept up-to-date in the latest news and updates in the legal community, the PLA will provide the members with a link to new or proposed legislation the PLA membership may find of interest. If there is new or proposed legislation you think may be of interest to the PLA membership, please contact the PLA Library Staff by email with your suggestion. 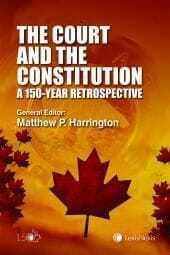 To celebrate the 150th birthday of Canada, this week the spotlight is on the book, The Court and the Constitution: A 150-Year Retrospective by Matthew P. Harrington, which was recently added to the PLA Library Collection. This unique collection of papers focuses on the role of the court in the development of three areas: Canadian Federalism, the Charter of Rights, and Private Law.